Pokhara—Nepal Government has announced the Prime Minister Employment Program today. Prime Minister KP Sharma Oli commenced the program amidst a formal ceremony held in Kathmandu this afternoon. The program aims the minimum employment of 100 days per annum to the unemployed citizens. If the government fails to provide employment of minimum stipulated days to the listed unemployed citizens, unemployment allowance would be provided. The citizen should meet the minimum criteria to have the unemployment allowance. According to information, the listing of unemployed citizens would be prepared in first phase. Ministry of Labour, Employment and Social Security has prepared the short list of 2,259 employment coordinators for all 753 local levels of Nepal. From that list 753 coordinators for all local levels would be selected. Then the listing of unemployed citizens aged between 18 to 59 would be started from the family that has no employed member. Then the listing of unemployed citizens aged between 18 to 59 would be started in employment service center from April 14, 2019. Following the listing, ESE would mobilize the listed citizens to some projects for employment. If listed person doesn’t go for work, he would be ousted from the list. According to provision, if a person doesn’t get job even for 1 day within a year, he would be given Rs 22,416 as an unemployment allowance. 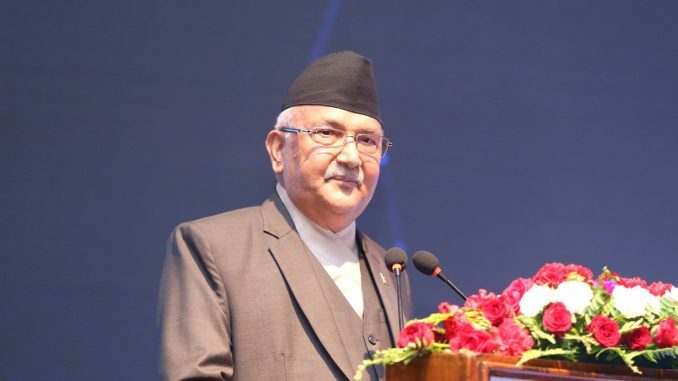 Addressing the announcement program PM Oli claimed that the PMEP is the new and historic model. He further added that the program would try to employ all the citizens listed as unemployed one. He also said that there is being hatched conspiracy to fragment the Nepal Communist party and to spoil the Nepal’s foreign relationship. “But those tries won’t be succeed’, he added.